Tesler's awesome sci-fi story follows Jasper Adams, a twelve-year-old Bounder. Like a small group of others, he was born specifically to go into space. He loves spending time with the other kids and learning how to be an astronaut. Everything seems like it’s going great - until Jasper and his friends learn that the people who brought them together may not be telling the Bounders the whole truth about why they're needed and what they're really there to do. 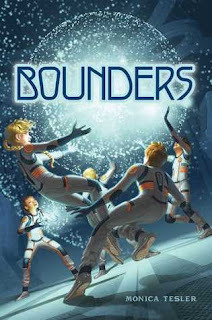 I was totally taken in by everything about this book: the amazing group of characters, the unique, well-developed world, and the excitement and adventure of it all. Prepare to be completely absorbed by this book, and then completely bummed that the next installment in the series isn't out yet. But fear not, Book 2 is COMING! Can't wait to revisit this wonderful world.